Selenium is at present the most powerful freeware of open source automation tool. It is developed by Jason Huggins and his team. This is release under the Apache 2.0 license and can be downloaded and used without any charge. Selenium is easy to get started with for simple functional testing of web application. It supports record and playback for testing web based application. Selenium supports multithreading feature i.e. multiple instance of script can be run on different browsers. 1. Selenium is pure open source, freeware and portable tool. 2. Selenium supports variety of languages that include Java, Perl, Python, C#, Ruby, Groovy, Java Script, and VB Script. etc. 5. Selenium can be integrated with ANT or Maven kind of framework for source code compilation. 6. Selenium can be integrated with TestNG testing framework for testing our applications and generating reports. 7. Selenium can be integrated with Jenkins or Hudson for continuous integration. 8. Selenium can be integrated with other open source tools for supporting other features. 9. Selenium can be used for Android, IPhone, Blackberry etc. based application testing. 10. Selenium supports very less CPU and RAM consumption for script execution. 1. Selenium needs very much expertise resources. The resource should also be very well versed in framework architecture. 2. 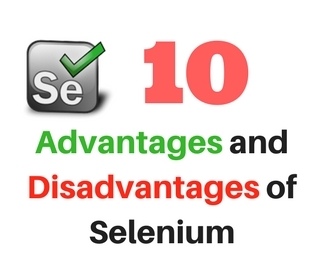 Selenium only supports web based application and does not support windows based application. 3. It is difficult to test Image based application. 4. Selenium need outside support for report generation activity like dependence on TestNG or Jenkins. 5. Selenium does not support built in add-ins support. 6. Selenium user lacks online support for the problems they face. 7. Selenium does not provide any built in IDE for script generation and it need other IDE like Eclipse for writing scripts. 8. Selenium script creation time is bit high. 9. Selenium does not support file upload facility. 10. Selenium partially supports for Dialog boxes.